RARE DIVOSTA EXTENDED POOL HOME WITH PEACEFUL LAKE VIEWS. 3 BEDROOM, 2 BATH PLUS DEN/OFFICE. 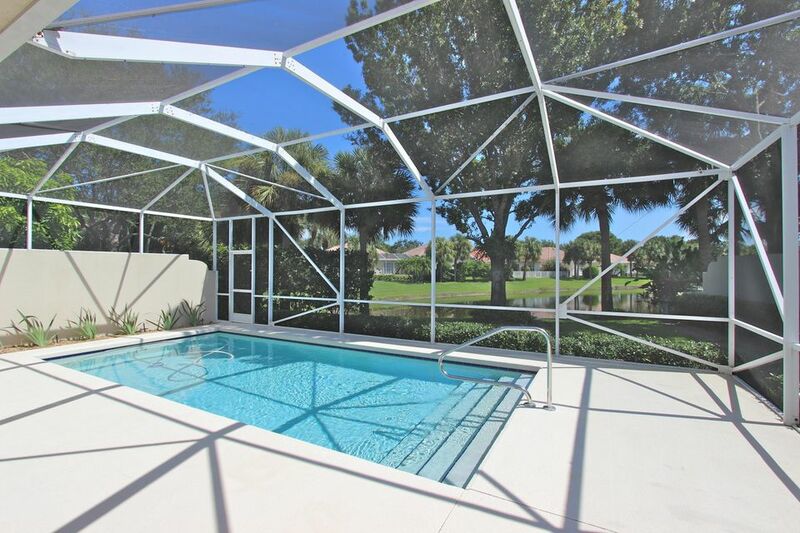 LARGE SCREENED POOL ENCLOSURE WITH PLENTY OF SPACE TO BARBECUE & ENTERTAIN. FEATURES STAINLESS APPLIANCES & BEAUTIFUL TILE FLOORS. REAL WOOD PLANTATION SHUTTERS, LARGE MASTER BEDROOM WITH WALK-IN CLOSET & HIS/HER BATH. ACCORDION SHUTTERS AND 2 CAR GARAGE W/PULL DOWN STAIRS FOR ADDED STORAGE. EXTENDED FLOOR PLAN OFFERS ADDITIONAL LIVING AREA FOR WONDERFUL FURNITURE LAYOUT OPTIONS. OAKS EAST IS A TERRIFIC DEVELOPMENT IN A PERFECT LOCATION. 10 MINUTE RIDE TO THE FLORIDA BEACHES, 15 MINUTES TO THE AIRPORT & CLOSE TO ALL THE SHOPPING AT THE GARDENS MALL, DOWNTOWN SHOPPES AND MANY CASUAL AND FINE RESTAURANTS ALONG PGA BLVD. PROTECTED BY A 24 HOUR MANNED GUARD GATE. IMMACULATE HOME, LIGHT & BRIGHT.